The Chic Country Girl: My 2016 Bucket List | Ideas for a wonderful year! My 2016 Bucket List | Ideas for a wonderful year! I'm sure you've heard this a lot already but I can't believe it's 2016, where did 2015 go? With a new year comes new hopes, dreams and resolutions. This year I haven't really set any resolutions for myself. Of course there are things I'd like to work on like: losing weight, learning something new, and to quit drinking soda. The usual things. But half the time most of us give up on them before mid February. So this year I thought id make a bucket list of fun adventures and ideas. If I don't complete them all that is okay. I am not setting no rules for this challenge of mine, it's more ideas and things to do. It's not set in stone. Just something for me to look at and hopefully complete a good few. I hope this list gives you some inspiration and hopefully along the way I will document my 2016 bucket list and share my experiences and the adventures I go on with you here and on my Instagram account. So lets get started with the list. 1.Local Travel: Everyone always says they want to visit far away exotic lands﻿, yet you can find new and fascinating places you've never visited in your own area. Search for must see places in your neck of the woods or maybe look for hidden treasures. 2.Photograph the little things: Everyone always gets the camera out for big events and occasions like: birthdays and weddings. Why not photograph your everyday life. Game night with the family or flowers in your backyard. Find the beauty in everyday. 3.Print pictures: Like I said above, I want to photograph lots of different things this year. So why not actually print them. They are doing no good sitting on your memory card or laptop. Hang them and share them with family & friends. 4. Support local events: Find fun and exciting events hosted by local towns. This is a fun way to be entertained and sometimes they are even FREE. 5.Explore small town attractions & museums: Where I live we have lots of little museums in towns with a fewer than a thousand people. 6. Visit farmers markets: Meet the local farmers who grow your food. Supporting your local community is good for everyone. 7.Help local charities: Volunteer, organize a fund raiser or bake sale and help those in your community that are less fortunate than yourself. 8. Be Bold : Whatever that means to you. Maybe wearing red lipstick for the first time or standing up for yourself. Always be heard! 9. Explore: Explore everything | Your town, new places, old favorites, new friends. 10.Picnic: Where you live there maybe a beautiful park or beach, where I live we have the mountains. Make a nice lunch or stop buy a local deli and pick out some yummy food. Pack a blanket and some tunes and head out for a day of eating and relaxing in nature. 13.Take a road trip: Maybe across country or just a weekend trip somewhere near your home. 14.Walk More: Take a stroll around the lake or hike up a mountain. 15.Learn: Take a class at your local community center. 16.Eat something new: Cook something you've never tried before or go out to a restaurant that has food you've never tasted before. 17. Garden: Grow your own food. Plant a rose garden and watch it bloom. 18.Create: Be more creative. Learn a new craft or take up sewing. Maybe learn to paint. 19. Go vintage shopping: At a Vintage shop or look through the racks of a local thrift shop. You can find amazing things just waiting to be brought back to life. 20. Go green: Recycle & Redo | Take something old and make it new again. Find old wood furniture and sand it down repaint it or stain, add new knobs and let it breathe new life. 21.Write down my thoughts: Keep a journal and update it more than twice in 2016. Write about your day to day life what you get up to and who you've seen. Or maybe dig a bit deeper and write about an important topic that affects you. 22. Genealogy: Discover who your family was and where they came from. The history of your blood can be very interesting. 23.Revamp your home: Make your home beautiful and cozy. Put all those old family photos in frames and decorate your home with them. Do simple DIY projects and add little touches of things you love. To make your home feel like you. 24.Party: Have little house parties with family & friends. Pick a theme: roaring 20's anyone? Or maybe make the food of the country you love most or wish to visit. Doesn't have to be over the top just have fun. 25. Enjoy 2016: Most importantly enjoy the year, your life and the things and people around you. 2016 will only come around once so make the most of it. I hope this gives you some ideas for the year. 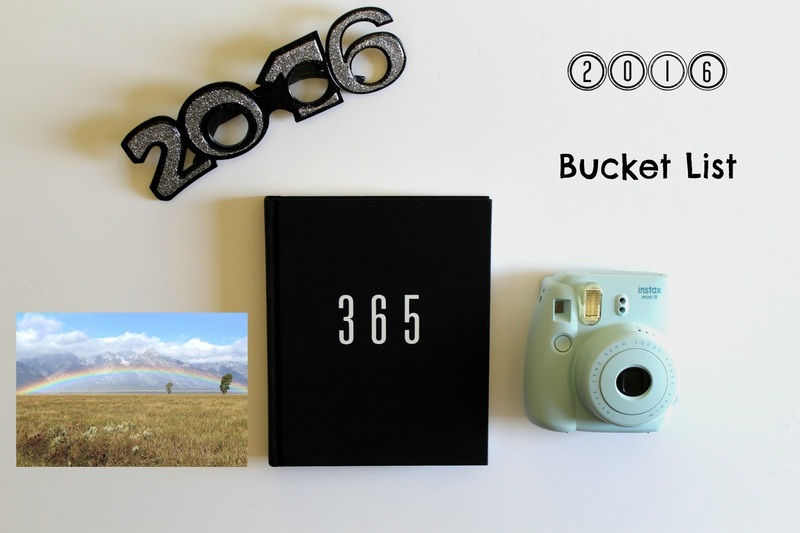 What's on your bucket list for 2016?